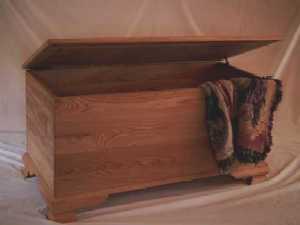 Custom cedar chest woods aren't limited to cedar. 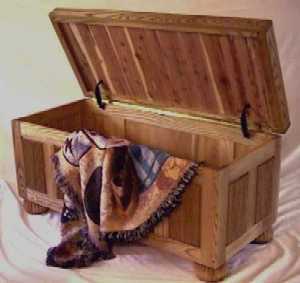 Choose your hope chest's exterior wood from our selection, line it with aromatic cedar, and still get moth protection. 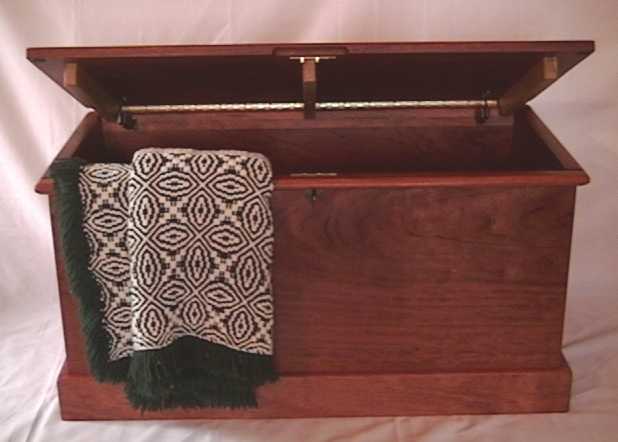 We offer: African Mahogany, Aromatic Cedar, Basswood, Birdseye Maple, Butternut, Bubinga, Cherry, Curly Maple, Hard Maple, Hickory, Makore, Pine, Purple Heart, Quarter sawn Red Oak, Quarter sawn White Oak, Red Elm, Red Oak, Sapele, Walnut, Western Red Cedar, White Ash, White Oak, Wormy Maple, and Yellow Birch. African Mahogany : Variations in the rather coarse grain seem to shimmer in the light. Naturally tends to darken with age. Aromatic Cedar : This cedar is classified as a softwood, and is moderately heavy. Its red heartwood sharply contrasts to the thin white sapwood, making a striking chest. It easily works to a smooth finish. We recommend a Natural oil stain or Fruitwood to slightly darken the colors for an antique appearance. 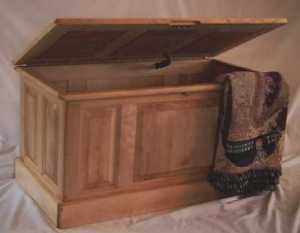 Interiors are always unfinished to preserve the aroma said to repel moths. Butternut : Lightweight Butternut is a wood with beautiful open grain movement and a natural golden brown color. Also known as White Walnut, when stained to match, it closely resembles black walnut in appearance but is not as hard or scratch resistant. Bubinga:Often referred to as African Rosewood, it is not a true rosewood. This West African wood is pink, vivid red, or red brown with purple streaks. Very dense and heavy, it has a fine texture and polishes very well. Cherry : A beautiful furniture wood, Cherry is classified as a medium heavy, strong hardwood. Its grain is straight, finely textured and close, usually with a gentle, waving figure. Since it has a natural tendency to darken with age, we recommend a natural oil finish. Curly Maple : So called because of the pattern of the grain found in certain hard maple boards which produce a shimmering effect when given a finish. Very attractive and adds value to a piece of furniture. Hard Maple : Fine and very uniform texture, making it difficult to stain~usually given a natural finish. However, it sands to a "smooth as glass" surface. Medium heavy wood, strong, and resistant to scratches and nicks. Grain is usually straight, but different patterns (curly, fiddleback, and bird's eye) add value to a piece. Hickory: May look like ash, but is much heavier, harder, and extremely durable. Wood texture is coarse, and grain is usually straight, though wavy and other irregular figures do occur. Makore (African Cherry): From African gold coast, Nigeria. This wood comes redder than mahogany and is much less prone to turn dark. On a recent large project involving several cabinetmakers, all experienced mild allergic reactions while sanding, so it is very important to have good dust control and wear a good dust mask. Once sanded and finished, we have no problem with this lovely wood. Color is light pink to deep red. The pattern is similar to Mahogany, but has dark growth lines and small pores similar to cherry. Straight grained with stripes. Makore has a finer texture than most Mahoganies. Pine : Eastern white pine is classified as a softwood. Lightweight and moderately low in strength. The wood has reasonably uniform texture and is straight grained. Quarter sawn Red Oak: Quarter sawn oak lumber is easily distinguished by the broad rays, which add to its good looks. This handsome hardwood takes stains well because of its coarse grain, and finishes nicely, though not at smoothly as the finer textured woods, such as cherry and maple. Red Oak: This handsome hardwood takes stains well because of its coarse grain, and finishes nicely, though not at smoothly as the finer textured woods, such as cherry and maple. 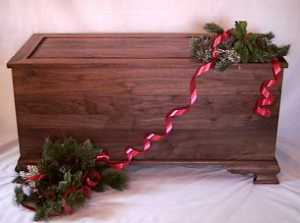 Walnut : Black Walnut is a favorite for furniture, a bit heavier than cherry. Color varies from purplish brown with thin, darker veins, to a grayish brown. Deepens to a beautiful, dark color when finished with a clear oil stain. Resists denting. Western Red Cedar : This light-weight wood has a reddish brown to a dull brown color with highlights of white from the sapwood. Classified as a softwood, has a coarse, uniform grain, and takes stain well. However it dents and scratches easily, giving it a "distressed " character over time. White Ash : Strong, straight grained wood, sometimes with a wavy grain that adds interest to its appearance. Resists nicks and scratches. Resembles oak if given a darkened stain..
White Oak: Hard, straight-grained wood, white oak has a more attractive figure than red oak. Durable and takes stain well, finishing more smoothly than red oak. Yellow Birch : Hard, heavy, and strong, resisting nicks and scratches. Light, red brown heartwood meets a white sapwood and takes stain well. Grain varies from tight to open with waving figures, depending on whether the lumber is quarter sawn or flat sawn. Western Red Cedar : Light-weight with a reddish brown to a dull brown color containing highlights of white from the sapwood. Classified as a softwood, with coarse, uniform grain, and takes stain well. However, it dents and scratches easily, giving it a "distressed " character over time.